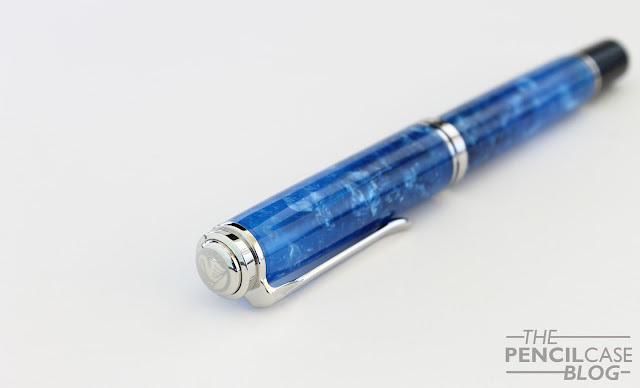 It's time for my terribly late review of the new Pelikan Souverän M805 Vibrant Blue! I don't want to repeat myself too much, so I'll try to keep things short and focus more on what's new rather than doing another full review of this pen. If you want to read about the full specs of the Pelikan M80x fountain pen, you can head over to my review of the classic M805 HERE. As with all Special releases of the M80x, the 'new' about it is basically the different material they used. It's the same old pen, but in a funky new jacket... And funky it is! 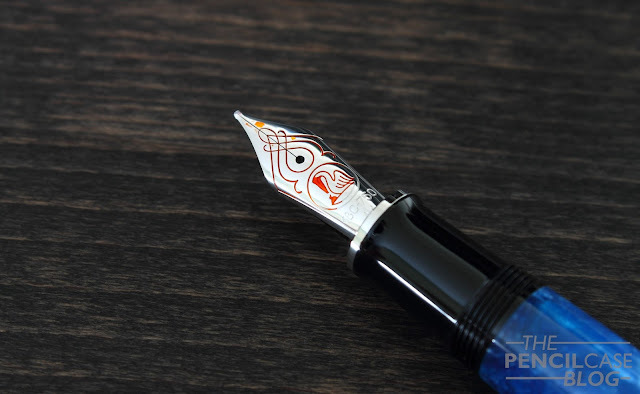 So much so that this is actually one of the first special editions from Pelikan that I wasn't immediately fond of (given, I had my initial doubts about the Burnt Orange too, but that one spoke to me from the second I first saw it, this one not so much). Granted, that could have something to do with the fact that I'm not a huge fan of the color blue, but I think it's more because it's so bright and playful. I admit, I used to only like black pens, but over the last two years or so, my preferences changed quite drastically (the biggest evidence being my bright orange Delta Dolcevita). Yet nevertheless something about this pen just didn't feel right. It lacks the classy appearance we're used to seeing from Pelikan, perhaps. Yet at the same time it's also something new (granted, they have had a couple other brightly colored releases in the past), something I'm sure will speak to a lot of people that aren't necessarily wowed by the classic green striped versions. 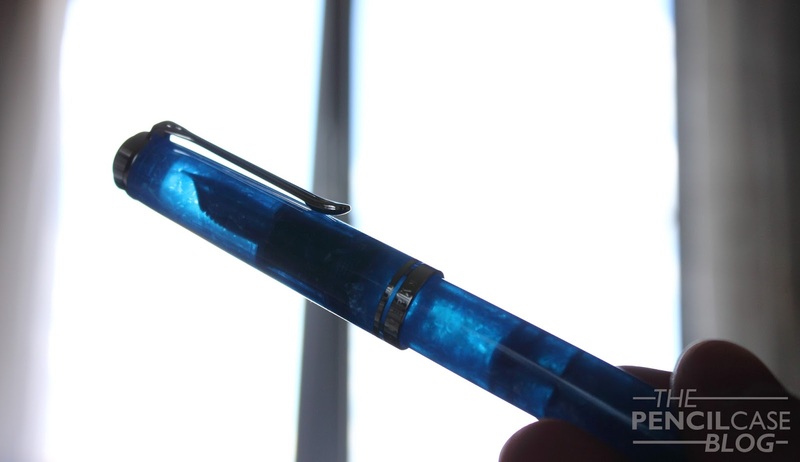 In that regard, brighter pens like this could mean big business for Pelikan. 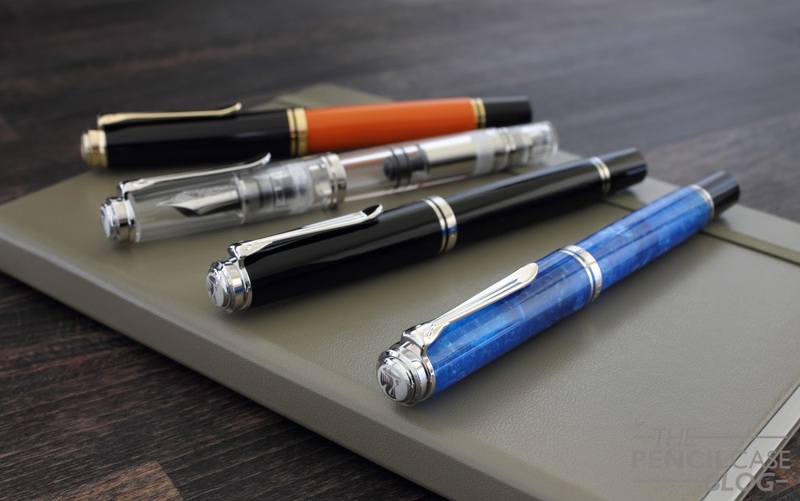 After all, bespoke pen makers like Shawn Newton, Carolina pen or Scriptorium (and many others) are widely known for their bold, funky creations, maybe Pelikan could hop on the same boat? Aside from possible market strategy, it's hard to deny that the bright -slightly translucent- blue acrylic they used is stunning. The material reminds me of cracked ice, it has loads of depth and chatoyance, and the subtly translucency adds to the effect with a subtle glimpse of the nib visible through the cap. Piston knob and grip section are just normal black pieces, which is a shame at first, but if you think about it, everything in the same material might have been a bit too much. Although not much, the black pieces add just the slightest bit of subtlety to keep it from being gaudy. The added benefit of having a translucent material, is that it doesn't have the same flaw as the Burnt Orange: the lack of an ink window. Basically identical to the striped models, it lets through just enough light to be able to see the ink sloshing around inside the barrel. Trims and nib are all rhodium plated, the nib being monotone rhodium-colored. 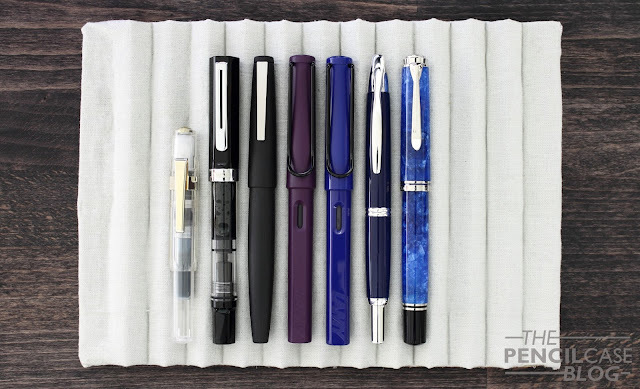 (Ever since the Stresemann, they implemented the monotone rhodium plated nibs on all rhodium-trimmed pens, instead of the usual bi-coloured nibs) The change to a monotone nibs is for the better, it definitely looks sleeker on a rhodium-trimmed pen like this. 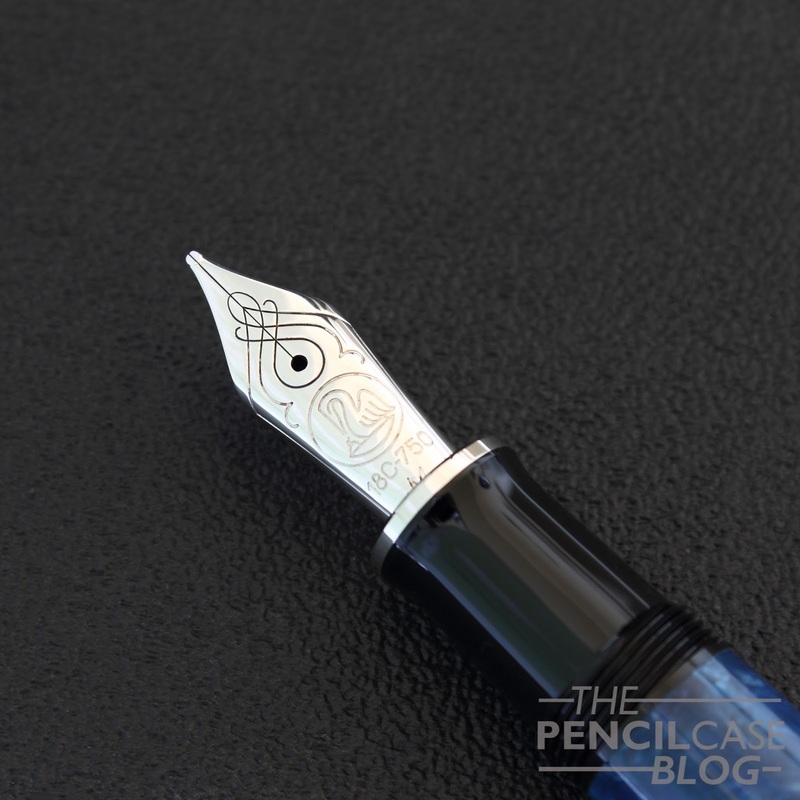 However I can't help but find the bi-colored nibs show off the beautiful engraving on the nib face a bit better. That's it really. Not an awful lot of changes, of course after all, it's still the same pen, but in a new jacket. 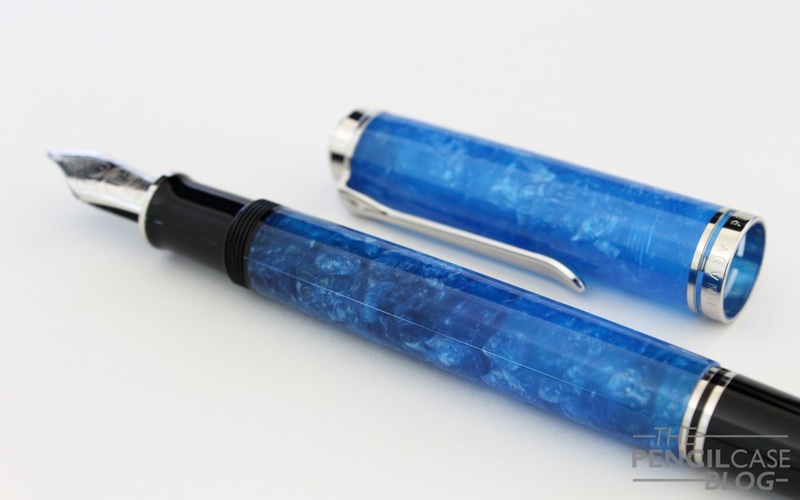 It's difficult to advice on buying this pen or not, It depends strongly on personal preference. I'm not a huge fan of this particular version because the color doesn't suit me personally, but if you like blue, this could be the best release so far. 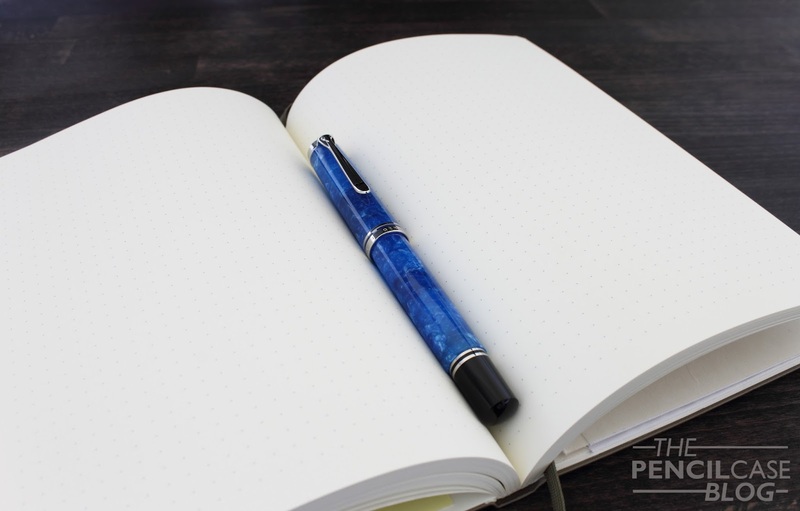 Point is, it's a Pelikan, so if you are in for a truly special material and a great overall pen, you won't have to look much further! 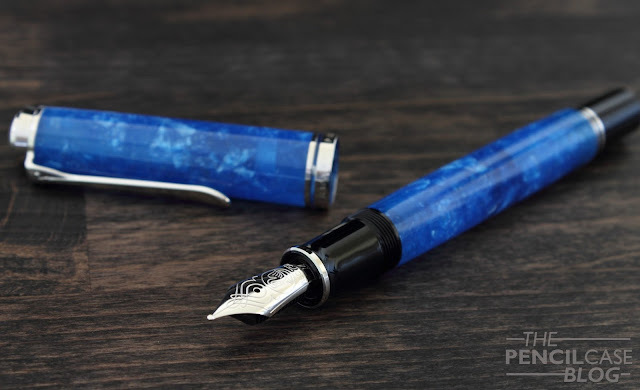 Retail price of the Vibrant blue (700 USD/ 490 EUR) is mostly in line with previous special editions like the burnt orange, which is good because the price of the M805 demonstrator was a bit too high IMHO. 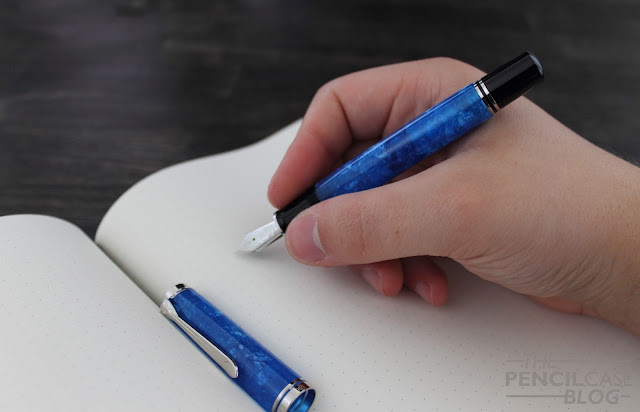 Note: this pen was lent to me by Pelikan, so I could write this review. I was in no way influenced in the making of this review, the opinions shared in this review are completely my own!